Independent Street Arts Network. Produced by Attitude is Everything. 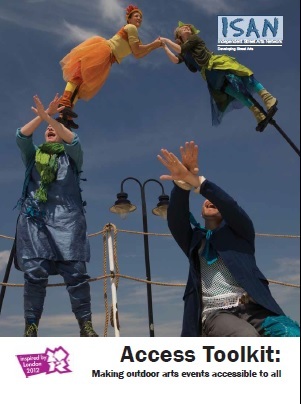 The toolkit highlights simple measures that organisers can undertake to improve access to any outdoor event . It includes four case studies that highlight the change in mindset that is required to overcome the complexities that can arise. References to legislation are now out of date in that they refer to the Disability Discrimination Act 1995. However, further advice is available on how this translates into the Equality Act 2010 by contacting Attitude is Everything, (or ourselves North Somerset Council in the case of issues local to the North Somerset area). ‹ Want to be a dementia friendly community?